The story of Lascoff Drugs is detailed in two obituaries, those of Jacob Leon Lascoff (1867-1943) and his son, Frederick D. Lascoff (1900-1970). "Dr. J. Leon Lascoff, pharmacist, holder of the Remington Honor Medal and a president of the American Pharmaceutical Association in 1936, died Tuesday night in his home, 230 Central Park West, after an illness of three months. His age was 75. A practicing pharmacist here for more than fifty years, he was senior partner in J. Leon Lascoff & Son, 1209 Lexington Avenue, at East Eighty-second Street. Dr. Lascoff was born in Vilna, Russian Poland, and was the son of the late Israel David Lascoff and the late Mrs. Anna R. Lascoff and was already a pharmacist, when he came to New York in 1892. The first drug store at which he applied for a job was that of David Hayes & Sons on Division Street. He was hired as a pharmacist at $2 a week and was informed that his first duty was to wash windows. Three days later the owner transferred him to the firm's new Fifth Avenue store at $10 a week. 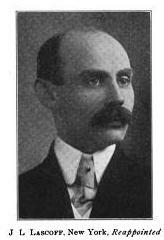 Dr. Lascoff remained with the firm until 1899, when he went into business for himself. He bought a drug store on 136th Street and found that nearly all of its stock had been sold after he had purchased the store. He restocked the store, and three weeks later sold it at a good profit. After beating up the man who had cheated him, Dr. Lascoff leased a drug store at Eighty-third Street and Lexington Avenue. He moved across the street in 1909, and in 1931 moved a block south to his own building. Throughout his career, Dr. Lascoff never sold anything but drugs in his store. In 1936 he filled his one millionth prescription there. ... He leaves a widow, Mrs. Clara Joachimson Lascoff; his son [Professor Frederick D. Lascoff of the Columbia College of Pharmacy], a sister, Mrs. Elizabeth Mazur of Englewood, N. J., and a grandchild." - The New York Times, 6 May 1943. "Dr. Frederick D. Lascoff, owner of a Yorkville pharmacy that specializes in rare drugs and old-time remedies, died yesterday in Mount Sinai, Hospital. He was 69 years old and lived at 125 East 72d Street. Dr. Lascoff sold leeches to battered prizefighters, catnip oil to lion hunters and various strange potions to people who had heard of his unusual shop. The pharmacy, on Lexington Avenue at 82d Street, conducts the bulk of its business filling standard prescriptions. But it enjoyed a reputation for producing bizarre concoctions upon request. Dr. Lascoff recalled once that one of the most unusual request [sic] had come from a colleague. The man's drug store had stopped smelling like a pharmacy because of strong food odors. Dr. Lascoff remedied the situation with a formula of phenol, valerian, asafetida and iodoform. The Lascoff establishment was founded in 1899 by his father, Dr. J. Leon Lascoff, and moved to its present quarters in a brownstone with high Gothic windows in 1931. A graduate of Columbia University, where he received a pharmacy degree in 1923, Dr. Lascoff taught at its College of Pharmaceutical Sciences for 20 years and became a trustee. He received his Doctor of Pharmacy degree from the Connecticut College of Pharmacy in 1941. ... Survivors include his widow, Emmy, and a son, Frederick D. Jr. ..." - The New York Times, 18 Aug. 1970. Practical Druggist and Pharmaceutical Review of Reviews, July 1911, available as a google book, shows a J. L. Lascoff Chemist show window. 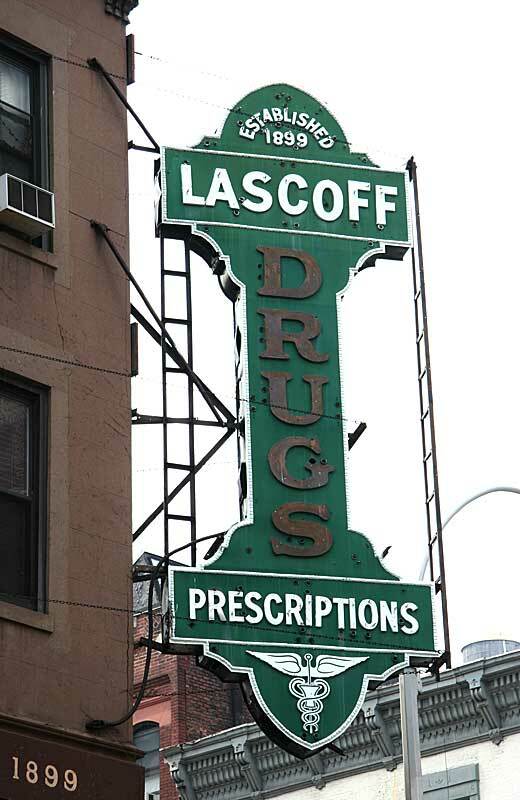 In 1911 Lascoff was located at 1223 Lexington Ave. at 83rd St.
An update on Lascoff Drugs appeared in the Times in 1998: "'It's the greatest establishment in New York,' said Penelope Wilder, speaking of Lascoff Apothecaries at Lexington Avenue and East 82d Street, founded in 1899. 'And Susan and Phil are the greatest, too, well mannered and lovely.' Susan and Phil Ragusa fairly blush at the compliment. But then again, they say, that's what their store is all about: service and the personal touch, the old-fashioned way of doing things. 'We're an oasis in the neighborhood,' Ms. Ragusa said. At the very least, a throwback to simpler and more unhurried times. Despite the competition of many new, chain-operated discount drug stores nearby, Lascoff's, the first licensed pharmacy in New York State, approaches its centenary without benefit of the gleaming trappings of modern merchandising. Its old wood and glass counters and its countless apothecary jars are the originals, brought in when the store's founder, J. Leon Lascoff, moved from the first location across the street more than 60 years ago. The pharmacists, some of whom have been with the store for decades, still make custom creams and potions to the specifications of local doctors, working in a two-story space whose second-floor balcony is crammed with bric-a-brac and mementos bearing witness to the pharmacy's history. Mr. Ragusa has been an owner of Lascoff's for about 25 years, and sole proprietor since 1995. His wife met him as a customer, when, like Ms. Wilder, she was drawn to the place by what they both call its 'friendly environment.' A former teacher, she has been working with him for a few years now. They live over the store, close to the business and the clientele. 'It's the world the way it used to be,' said Ms. Wilder, who lives nearby and has shopped at the store for more than 20 years. She describes her relationship with the Ragusas as one of warm cordiality, not necessarily an intimate one but solid and important nonetheless. 'We chat about the neighborhood,' she said, 'and inquire into each other's health.' 'These days people have forgotten how to connect with each other on a business level,' Ms. Wilder said. 'But not at Lascoff's.' Beyond arranging for Ms. Wilder's medicines when she needs them, Ms. Ragusa says she goes out of her way to get Ms. Wilder things that she needs that the pharmacy does not necessarily stock, like certain toiletries. Sometimes, she herself will go to another retail store to buy the things Ms. Wilder wants. When they meet, they talk and laugh, about matters large and small. Ms. Ragusa knows that Ms. Wilder is a big fan of John Wayne. 'Sometimes I give her clippings about him when I see them in the papers,' Ms. Ragusa says. 'She likes that.' Of course, all of this attention does not come cheap. Lascoff's does not accept any drug plans, and it doesn't discount. But Ms. Wilder simply doesn't care. 'I would rather have quality,' she said. 'You pay for discounts in the long run by losing human relationships. And those are much more rewarding in the end.' BERNARD STAMLER" - The New York Times, 1 Feb. 1998. Thomas E. Rinaldi in New York Neon (2013) says the Lascoff sign was made in 1931. The Historic Shops & Restaurants of New York, by Ellen Williams and Steve Radlauer (2002), mistakenly describes the "vine-covered brownstone" at 1209 Lexington Avenue as the store J. Leon Lascoff opened in 1899. According to Lascoff's obituary quoted above, Lascoff moved to this building in 1931.